I will never forget the argument beside the salad bar. A conservative co-worker in our Physical Plant on campus knew I opposed Bush's war of choice, and he confronted me as I got my lettuce. Students, largely disengaged then as now from geopolitics, looked on at the two old people fighting in public. "It's going to happen! We clean out the nest!" He said, emphatically. "Al Qaeda is in Afghanistan, not Iraq, and that brute Saddam did not attack us on 9/11." I try to reason. "You don't get it! This will be easy! We will turn the tanks right when we are done, and get Iran fixed too." He was gloating, and the students, the age of those who'd be dying in Bush's Middle Eastern game of Risk, were rolling their eyes. 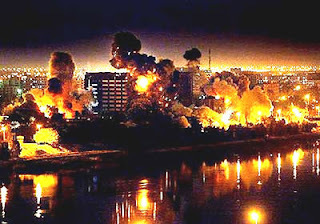 "It won't be so easy; Iraq is a modern invention, a bunch of ethnic groups crammed together by the old Colonial powers. They'll turn on each other as soon as the brute at the top gets two in the hat." "You are just spouting the typical liberal line." He was done. So was I. I reached for the dressing. Ten years ago, it was still the Freedom-Fries Era, of salad-bar "Old Europe" vs. red-meat "Real Americans." I was getting a salad, then wrote letters and op-ed columns. He got a burger and put a flag decal on his huge pickup truck. What does it matter that I was right in the end? 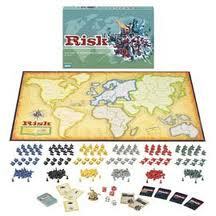 It was not a Risk game, and 4,500 dead Americans and God knows how many dead Iraqis later, that nation is a powder-keg. If it does not explode again, it will be the will of the Iraqi people and the resilience of their democracy, purchased with so much blood, that see it through. Bush went back to his ranch and oblivion. We have that consolation at least about a man who set America firmly on a long-term decline with two wars paid for on debt, tax-cuts in the midst of those expensive conflicts, and exhortations not to sacrifice but to go shopping in defense of what he called a "sacred lifestyle." Cheney, Rumsfeld, and their minions who massaged lies into a war did not see prison. Afghanistan remains a missed opportunity, after an ADHD President and his war-criminal Svengali of a Vice President decided a bigger opportunity loomed. Then a clownish and finally, small man put on his flight suit to declare not just "mission accomplished" but, essentially, "game over, baby." Except that it's not, and our tanks have come home. Yet the game goes on. Memories of tortured prisoners, religious civil war, and dead civilians will linger in Iraq. My adversary over the celery stalks just says hello now. That was my last conversation with him and I don't need to rub my correct assessment in. How's that for some shock and awe?